Antioxidant supplements : Are You Getting What You're Paying For? So now we've established how antioxidants are the most important thing for good health (if you don't know that yet, better check out the rest of the website). How do you make sure you're getting what you need? The quick answer: antioxidant supplements. Sure, it's still important to eat a good diet, but that won't give you the amounts you need for optimal health. Even if you ate the perfect diet 24/7 (Yeah, right. Who does that?) It is no longer possible to get all the nutrients your body needs from food alone. Like I said, nobody eats the perfect diet, but the truth is that the majority of the population eats a fairly poor diet. With the busy lifestyles everyone has today, there is rarely time for the home-cooked sit-down family meal. Even if you can avoid eating fast-food regularly (please! ), the "home-cooked meal" is still usually prepared using a decent amount of processed food. The more processing food undergoes, the more nutrients are lost. I admit that that's the situation in my house more often than not. Between work and shuttling children to activities, that's the only way we can manage it- and we're not even as busy as most families. AND our diet is considered better than the average! There are less nutrients in foods today than there used to be. Again, processing is a big reason for this. But even if you choose whole foods, you're getting less from them than you used to. Between genetic manipulation of foods and nutrient depletion of the soil, you're getting significantly less out of your carrots today than you did even 20 years ago. And I'm not even going to discuss the added toxicities from pesticides, pollution, etc. Science has discovered that your body needs more nutrients than once thought. New research is showing that your body needs a LOT more nutrients to function optimally. And they didn't even know about the importance of antioxidants until the last decade or so. So the optimal amounts of antioxidants are still being investigated. So many people think that the Recommended Daily Intakes (RDI's) are what your body needs. The RDI's were actually developed by the US Army in WWII so they would know the minimum amount they could feed their soldiers without them getting sick. For example, the RDI for vitamin C is 75 mg, which is just enough to prevent scurvy. The optimal amount is yet to be determined. It is such a powerful antioxidant that so far, the more you take, the more benefits are seen. Even 2000 mg per day seems to be a conservative amount. 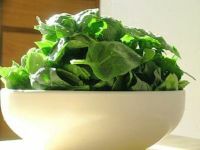 You would need to eat 33 lbs of spinach everyday just to get the amount of Vitamin E your body needs to function optimally. IMPOSSIBLE! (That's about 65 of the huge bowls pictured here!) And that's just Vitamin E- never mind all the other nutrients your body needs too. So you can see how antioxidant supplements might be a handy option. Antioxidant supplements are important for people of ALL ages. Basically, as soon as you start eating food, you should be supplementing. Learn more about the importance of antioxidants for children and why the younger you start, the better. As you age, antioxidant supplements become even more important, because the older you get, the less antioxidants your body is able to make on its own. That's a big reason for the quicker decline in health you see in older people. Now you go to your nearby store and ask for the best antioxidant supplement right? WRONG! Please no, I beg you! !!!!! CLICK HERE TO READ THIS PAGE FIRST !!!!! It's the most important page on my website!!!!!! Have a question, tip or interesting story about antioxidant supplements? Post it here- there is no member login or registration required.